Temperatures will hopefully be in the 70’s. You know that Homecoming Day the atmosphere at the Parade will be Flowing, Morgan’s King and Queen will definitely be Glowing. Those Floats will be bursting with soulful creativity, the music will be chaotic but in no ways psychotic. The Magnificent Marching Machine will be on display while the children will watch with anxious anticipation. 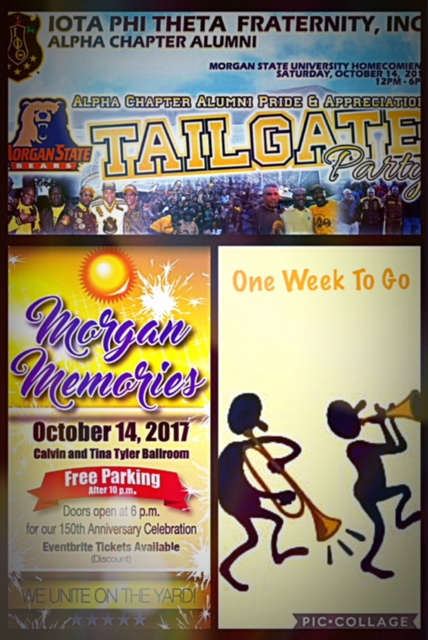 Can you believe that Morgan State University’s Homecoming is so near? Just one more week so let’s be clear homecoming time is nearly here. Morgan State University Homecoming Weekend 2017 starts Friday night at the Morgan Gala if you didn’t get a ticket by now my dear on this particular night you will be somewhere else I fear. Hey I don’t care for Saturday October 14th is nearly here. Where will be quite early and bright, some may even try to spend the night. Where will be? On the Yard I see, it’s now a National Treasure, now that’s something that should bring everyone pleasure. The weekend, the fun, oh my the fun, I’ll need new sneaks until Saturday night is done. The Gala, The Parade, The Homecoming Game, each and every homecoming is never the same. We will meet at the tents and the music and drinks will flowing, didn’t I tell you Mr. & Mrs. Morgan are truly glowing? The day is filled with reconnections, new connections, and so, so many recollections. This year we celebrate 150 years in the making. So you know in 2017 the Yard will be definitely baking and both of the bridges will definitely be shaking. So get ready, get set, get into action Homecoming 17 has already got huge traction. Did I mention the game? Did I mention the tents? Did I mention Morgan Memories? Why do I even leave the Yard because on October 14th you’re captured completely from morning until you fall fast asleep? I see my Brown & Gold Brothers all over the Yard. You Iota Phi Theta, founded at Morgan, but on Homecoming Day, no one organization rules the Yard. We share it with my Brothers from Omega Psi Phi, Kappa Alpha Psi, Alpha Phi Alpha, Phi Beta Sigma, Groove Phi Groove, Tau Alpha Upsilon and those Sisters, yes, those lovely vivacious Sisters from Delta Sigma Theta , Alpha Kappa Alpha , Zeta Phi Beta , Sigma Gamma Rho, and Swing Phi Swing if you didn’t pledge, well it don’t mean a thing. You attended Morgan and that’s quite a ring. Homecoming at a black college campus is the epitome of fun. It’s the EPICNESS of the black educational social experience. To those of you blacks who attended those majority white schools. Well you can’t understand, no hard feelings but BLACKNESS RULES HOMECOMING DAY. We would love for you to join us in B'more starting Friday, October 13th and Saturday, October 14th. and stay the whole weekend. It's a black experience that cannot be replicated or duplicated. It is in its very essence UNIQUE, SLEEK and DYNAMIC. So please join the Brothers of Iota Phi Theta Fraternity at THE IOTA PHI THETA TENT and then once we close down the TENT. 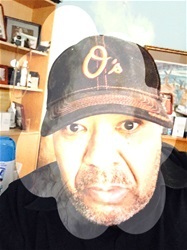 Please join the entire Morgan Family at Morgan Memories 2017, as we celebrate 150 years of growing The Morgan Experience at Morgan State University.